Elegant silk scarves are becoming more and more a necessary accessory for business men. With their bright colors, soft grip and light elegance silk scarves are in demand. Silk scarves are stylish and traditional. Tied with a knot or just worn open around the suit’s jacket – the silk scarf is one of the most elegant and stylish accessories for men’s wardrobe. At ALBERT KREUZ’s online shop you can choose your silk scarf from nearly 300 finest Italian silk designs. Your silk scarf is custom-made for you in our traditional German manufacturing facility Stange Berlin. Our silk scarves to wear under your shirt can be found under "Ascot/Tie-scarf". Whatever you prefer - all our silk scarves are classy, fashionable and casual at the same time. 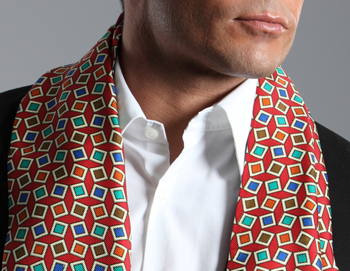 A silk scarf is the perfect alternative to the classic tie or bow tie. Be inspired and choose from our 300 different classy Italian silk designs and order your personal scarf at ALBERT KREUZ's online shop today! Silk scarves from ALBERT KREUZ - exclusively hand-made of finest classy Italian pure silk in our traditional German manufacturing facility Stange Berlin!